If you haven’t already take the 10-question online survey, let the design team know what matters to you. 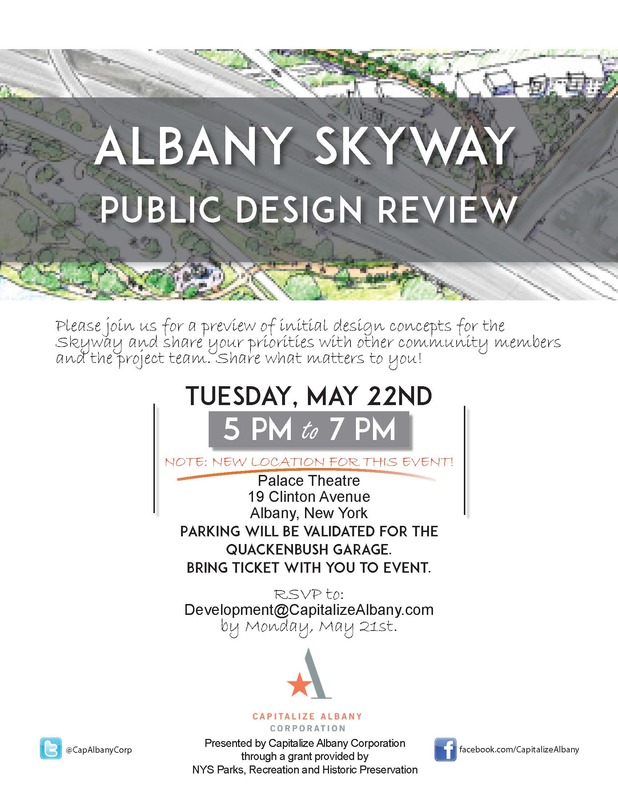 With support from Governor Cuomo and the announced $3.1 million committed, Capitalize Albany Corporation is continuing to gather public input with a second public event in order to generate ideas that will support the Skyway’s design and engineering. Initial design concepts will be previewed at the meeting. The Skyway is a project that will ultimately result in the conversion of the I-787 northbound exit ramp from Quay Street to Clinton Avenue — into the Region’s first and only elevated linear park. Join the project team from 5:00 – 7:00 p.m. at the Palace Theatre on Tuesday, May 22. Learn more about the future potential of the Skyway and share your priorities and design ideas. The Impact Downtown Albany strategic plan, the City’s comprehensive plan, LWRP and waterfront master plan show demand for, and an economic need to increase connections from downtown to the waterfront. Currently, I-787 presents an imposing barrier disassociating downtown and surrounding neighborhoods from the river. The completed conversion of the exit ramp would transform the underutilized infrastructure into a landscaped multi-use connection, from downtown Albany and surrounding neighborhoods including Arbor Hill and Sheridan Hollow, to the Corning Riverfront Park. Upon conversion —the former ramp would serve as a fully ADA compliant promenade, bike route and linear park making valuable connections to the Hudson River — dramatically increasing accessibility to both downtown and the waterfront. In addition to serving as a waterfront connection, the Skyway would be an amenity for Albany’s downtown neighborhoods, creating an experience for its users and becoming a regional destination. The project’s sustainability impact will be an additional benefit. Once completed, the project would function much like a green roof, absorbing, filtering and diverting storm runoff that would otherwise enter the City’s combined sewers and eventually the Hudson.